Yesterday I did something wonderful. I postponed my dentist appointment! It was for teeth cleaning. They do it every six months. Ow ow ow ow ow!! Last time I actually got mad. They have these hygienists at my dentist's. They are all very good-looking young women and they are like little Nazis, fastidious and impersonal. And the one cleaning my teeth was just scraping away and killing me. I did not just fall off a turnip truck. Pain at the dentist's is out. Comfort is in. You hear that on radio commercials. You have the right these days at the dentist's not to be hurt! And my rights were being violated. What about no-pain dentistry? Also, what about this myth that has it that some dentist's offices let you play your own music? I have been hearing about that for years and I have never, ever run across it in real life. I am always subject to whatever crud they have tossed up on their sound system. Once when I was at the ortho they were playing "It Hurts So Good." Honest! Why can't I be listening to Leonard Pennario? I would feel better! 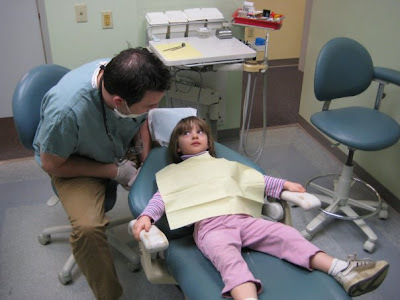 You are not supposed to have bad experiences at the dentist any more in this day and age. 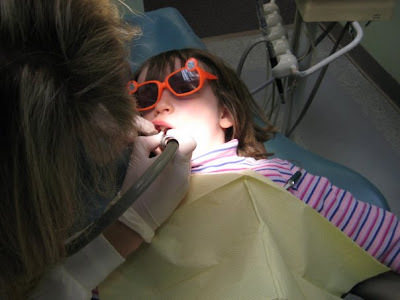 Observe this picture of my niece Barbara at the dentist. She is not afraid! Isn't that the greatest? I could not resist running that picture. Here is our Barbara being worked on. That was not me six months ago, I will say that. Not only was I offered NO funky sunglasses but I was squirming around IN PAIN! And what really made me mad was that the nurse didn't notice. She was blithely watching "Dr. Phil" as she scraped away at me. Her only word, every ten minutes or so, was: "Spit." Finally when I took a spit break, I couldn't take it any more. "How much longer is this going to go on?" I burst out. She looked at me as if I were nuts. "Not much longer," she said. It still makes me angry when I think about it. Which brings me to yesterday. Howard and I have a joke and like most of our jokes it goes back to his cousin Ron Moss. There was one time I got a traffic ticket and had to fight it. Moss heard from Howard about how I was going to have to go to this hearing and defend myself. Moss' advice on the hearing: "It can be postponed!" He knew from his vast personal experience with this kind of thing that if you requested it they would have to put off the hearing a number of months. Problem solved! 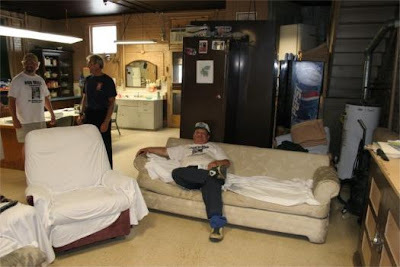 Here is a picture of Moss postponing something so he can lounge around instead at the Lovejoy firehouse. Back when Moss first told me "It can be postponed," I did not take his advice. I went to the hearing on schedule. I won, too. That was the famous instance where I got carried away with my own rhetoric and cried. Probably in court they are still talking about it. But comes a time when Moss's advice is good. And yesterday was one of those times. 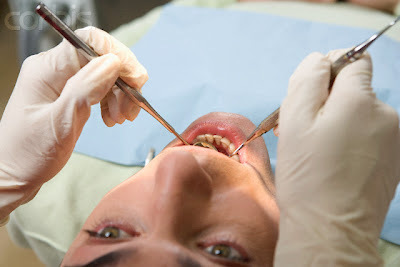 I loved the experience of calling the dentist and postponing my appointment. And they were booked up into June! They finally rescheduled me on May 29. How empowering! My day took on a rosy glow. Take it from me: When the going gets tough, remember Moss' magic words: "It can be postponed!" You'd think with all this technology that they'd develop lasers to clean your teeth. I HATE that scraper thing and all of its unholy brethren.